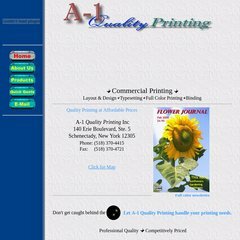 www.A-1qualityprinting.com - Welcome to A-1 Quality Printing Inc. The programming language environment is ASP.NET. There are 1 Nameservers, ns.a-1qualityprinting.com. It is hosted by Illuminated Hosting Service Llc (California, Escondido,) using Microsoft-IIS/7 web server. PING (67.21.112.182) 56(84) bytes of data. A ping speed test response, is timed at 50.4 ms.